Paul Indrek Kostabi (also known as Ena; born October 1, 1962 in Whittier, California) is an American artist, musician, music producer and audio engineer. He is the brother of artist Mark Kostabi. Kostabi became part of the CBGB Festival in 2014 exhibiting paintings alongside photographers Bob Gruen, Michael Lavine and Chris Stein. He also painted live in Times Square while Devo and Jane's Addiction performed. 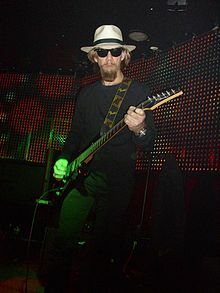 Kostabi is credited with naming the painting Use Your Illusion by Mark Kostabi which became the title for Guns N' Roses studio albums volume 1 and 2. 2012 launches brand Bad Things with artwork on various electronic device covers such as iPhones. 2016 Kostabi #sprkl character featured in Pokémon GO game. ^ Niineste, Mart (May 3, 2008). "Paul Kostabi – eesti päritolu Ameerika punkar" (in Estonian). Eesti Päevaleht. Retrieved May 25, 2010. ^ "Paul Kostabi". ArtSlant. Retrieved May 26, 2010.